與DJ Junior(TW)合作最新單曲At Least We Lived,已登上Beatport Top 10. Coming from a musical family (hisfather has been a composerforover 40 years) , He has had a natural upbringing around music. He beganwriting his own melodies at a young age. Though He struggled at Music Academy with musical theory, one of his main strength swas the compositional and musical improvisation aspects. He always wanted to let his inspiration go free when he was playing the instrument and he is much the same with music production . Those that share his craft will tell you that the art of music production has many , many great benefits . For him , It was not only been a passion since a nearly age , but also something that he managed to forge a career out of . For the past years however , the music he made has effectively been packaged up and sold to the highest bidder . 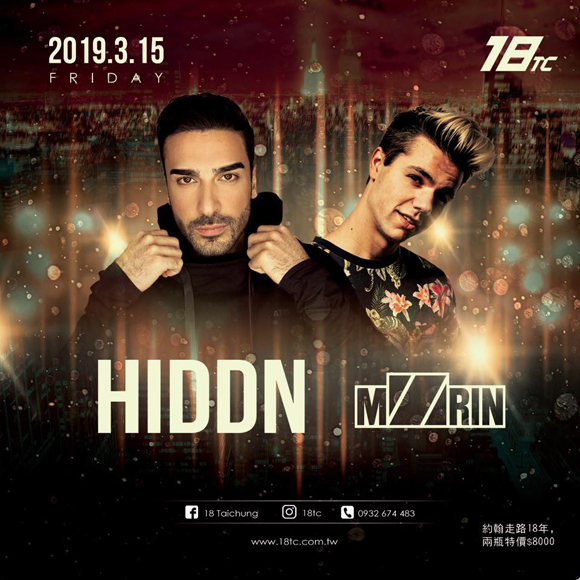 HIDDN has collaborated with several DJ's of the DJ Mag Top 100 these last years and he has produced songs that have been classified in the top 100 Beatport . He decided to start HIDDN project when some of his sounds were played recently at Tomorrowland and it was precisely at that point that he got the click, where he said, "I should have been there on stage sharing my music with people ! ". It made him realize that he wanted to be at theforefront and no longer just in the shadows. With the HIDDN project, He wanted to tell his own story in music. Of course, Ghost production will always be something that He greatly appreciated as it has given him a platform, a foundation from which He can now go on and do his own thing. Now is his time to show the world what he can do . He wants the HIDDN projectto be something that touches many different sounds and styles of Dance Music, but also encompasses his family's musical heritage. In January 2017, HIDDN signed his Solo Debut Album "OUT OF THE SHADOWS" with Armada Music.